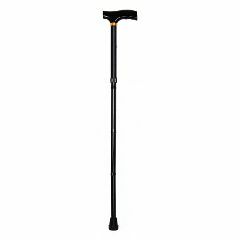 AllegroMedical.com presents The McKesson® Folding T-Handle Aluminum Cane. . Sleek black, scratch-resistant finish. Standard-styled cane for enhanced maneuverability allowing use in narrow spaces such as staircases, T-shaped handle provides a secure grip and better weight distribution over the cane. Lightweight aluminum construction ideal for users with limited upper body strength. Folds into four convenient parts and includes plastic carry case for easy travel and storage. Height can be easily adjusted in 1" increments from 33 - 37" with a single push button. This device intended for medical purposes that is used to provide minimal weight support while walking. Not made with natural rubber latex.